I can't believe it's already been a year since I moved into my fixer upper! 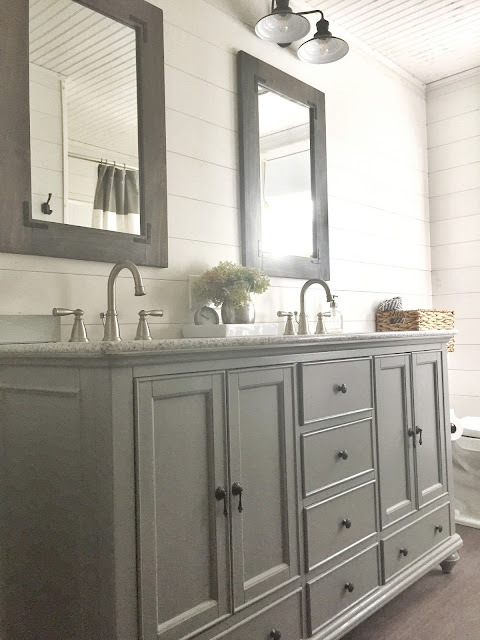 In some ways, the house has completely transformed and yet there still seems to be so many little 'to do' items left on the list (like installing baseboard trim, changing out all the brass door knobs and hinges, and replacing the outlet and radiator covers). 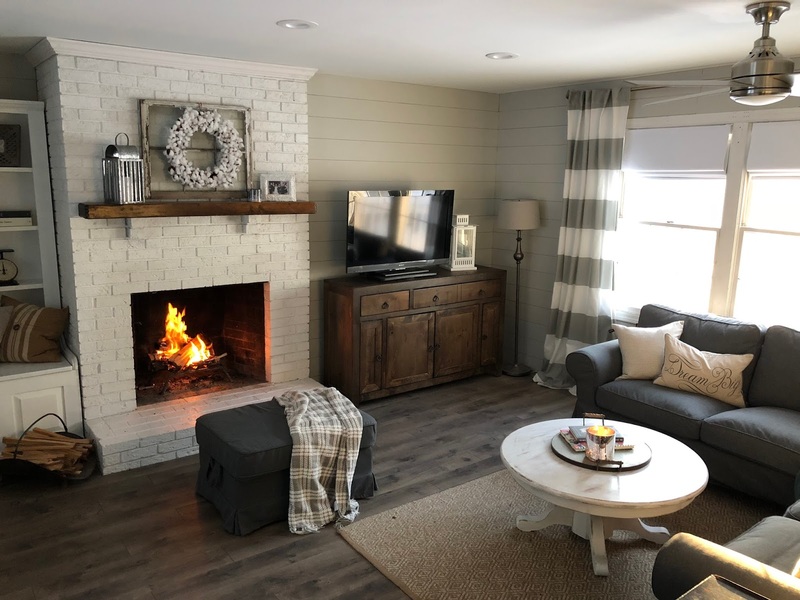 The bigger projects completed included a new kitchen, new half and full bathrooms, refinished hardwood floors upstairs, new laminate installed throughout the main floor, new lighting, and new paint inside and out. 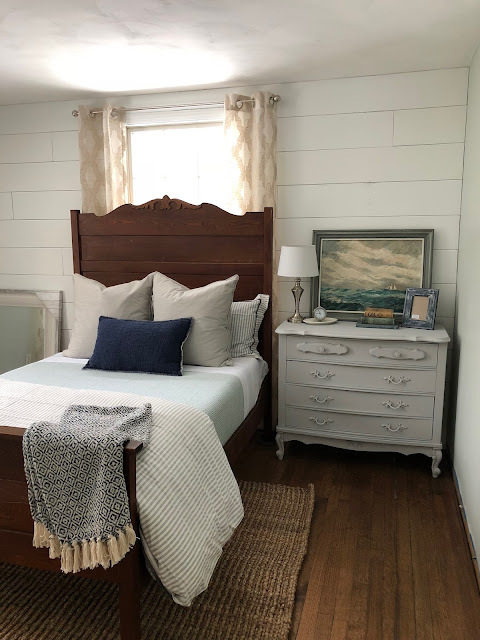 I hope to write separate posts with more details for each room in the house like I did for the master bedroom-the first room to actually be completed so I could have at least one pretty, comfortable, renovation-free place to seek respite while the rest of the house was in shambles. For now, here are a few transformation photos of each room to mark this special one-year renovation anniversary! 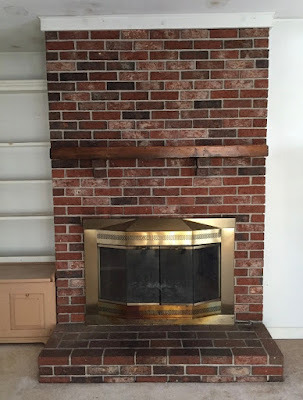 You can find many of the items seen in the 'after' photos on my Amazon Favorites page. Hopefully this makes it easier to 'shop my house'! 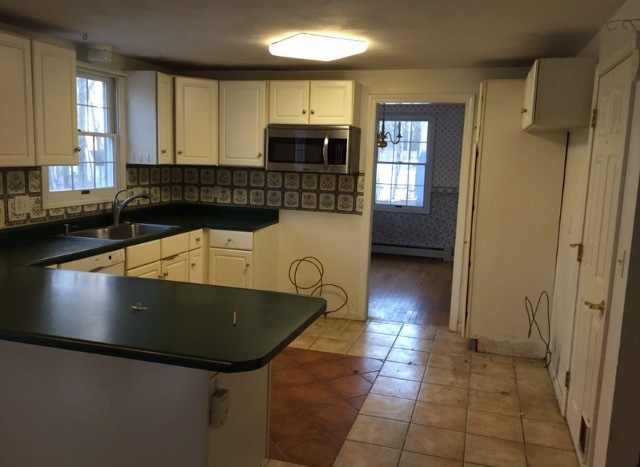 What was once two separate spaces, the kitchen and dining room became one when a wall was removed. 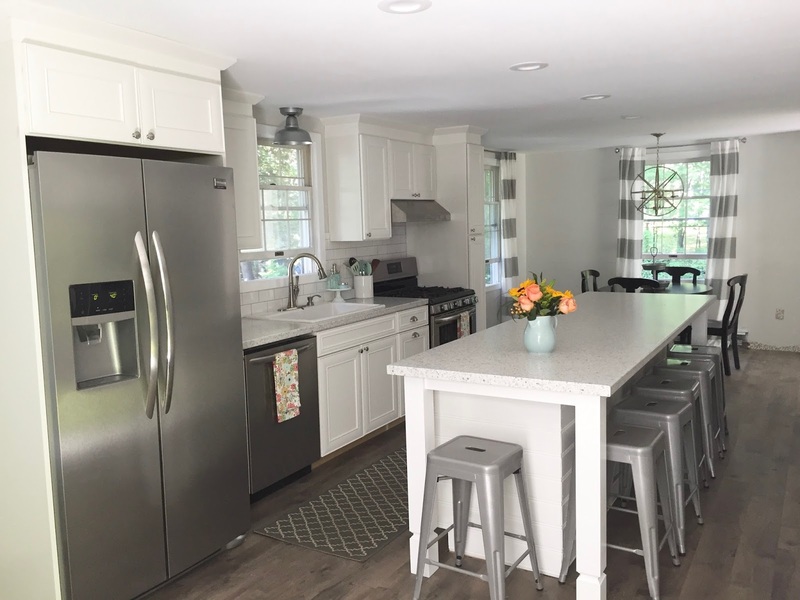 This not only opened up the space for entertaining, it also allowed for more light in the kitchen since the dining room has three large windows. 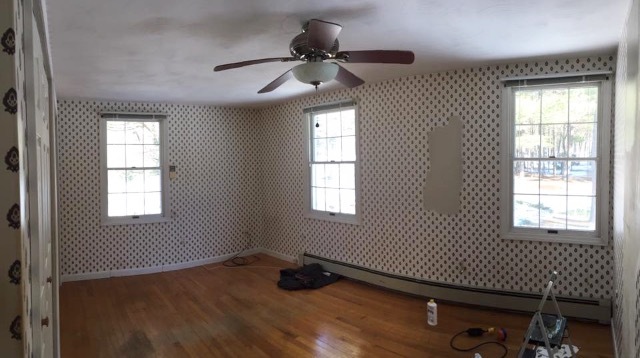 This is the room that really 'sold' me on this house. I saw so much potential in the fireplace and built-ins. 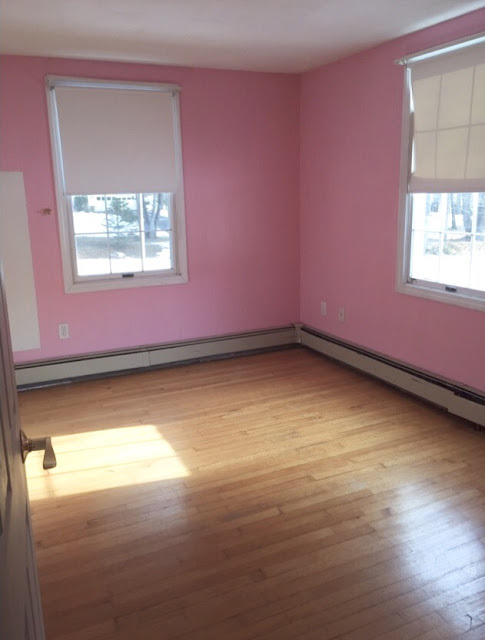 It's a large room, great for entertaining, but somehow it also feels cozy. 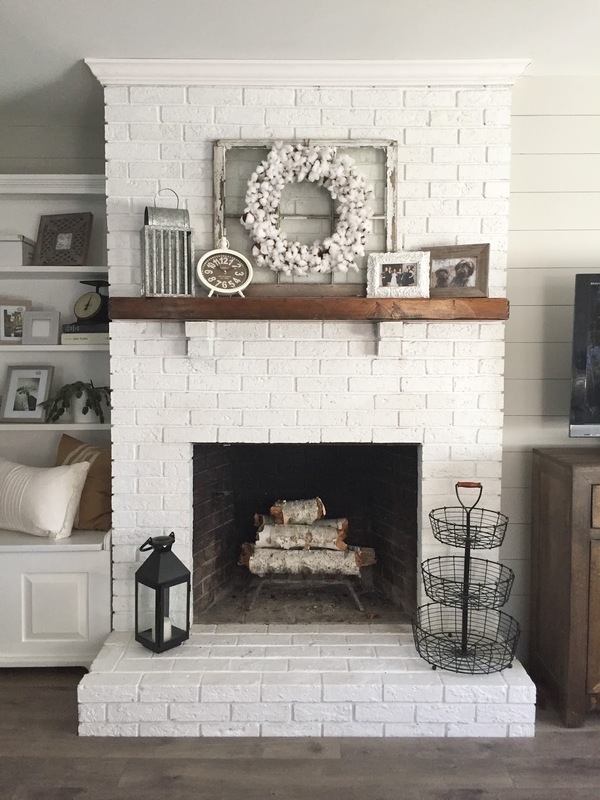 The biggest transformation was definitely painting the fireplace and adding faux shiplap to the walls. 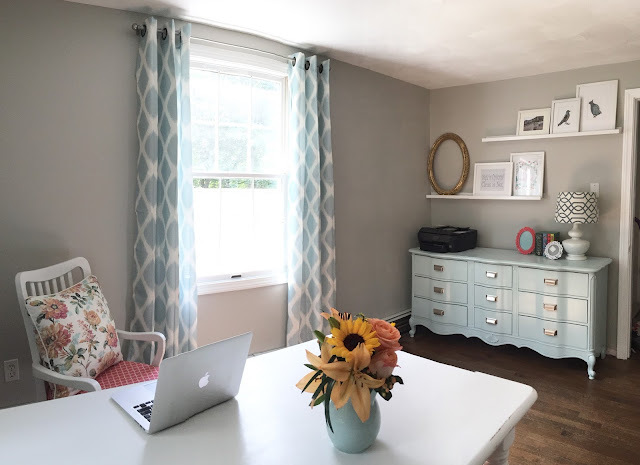 Wall color in this room is Repose Gray by Sherwin Williams. 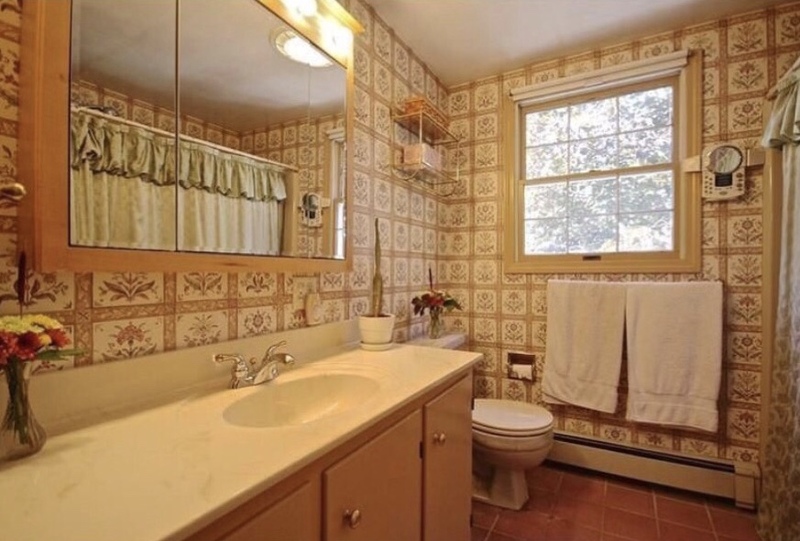 Both the full bath and the downstairs half bath were complete gut jobs from floor to ceiling. Wood plank walls & beadboard were added as well as new vanities and lighting. 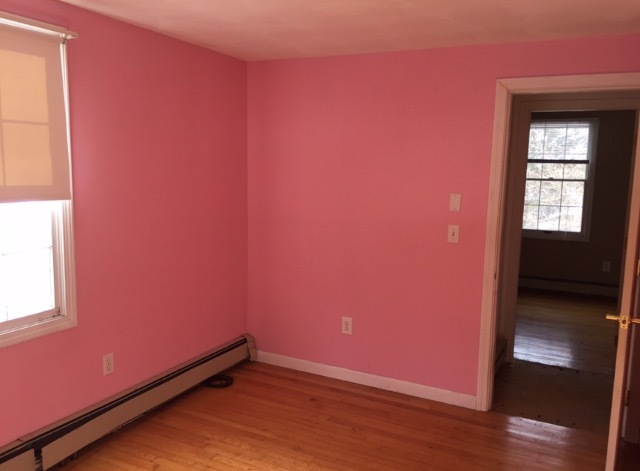 Both rooms still need some finish work, including caulking, painting, trim and replacing the radiator covers. Vanities are the 'Newport' Home Decorators Collection from Home Depot. I've also found a similar option here. As I mentioned above, I set to work on the master bedroom right away because I wanted at least one finished space while the renovation chaos was happening in the rest of the house. Wall color is Window Pane by Sherwin Williams. Head on over to this post to see more photos and details of this space. This house actually has 4 bedrooms so I have lots of space for two dedicated guest rooms and a craft room! 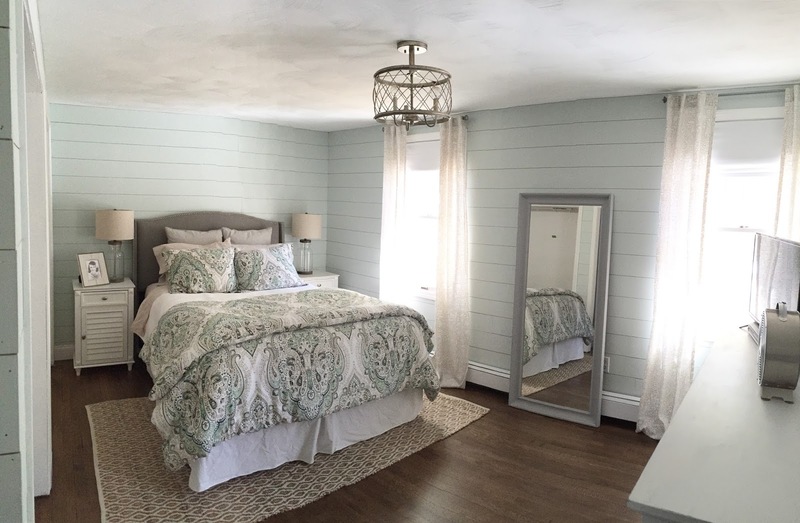 I've only decorated one guest room so far...the wall color is one of my all time favorites- Sea Salt by Sherwin Williams. I also incorporated a lot of antique and thrifted finds in this room! 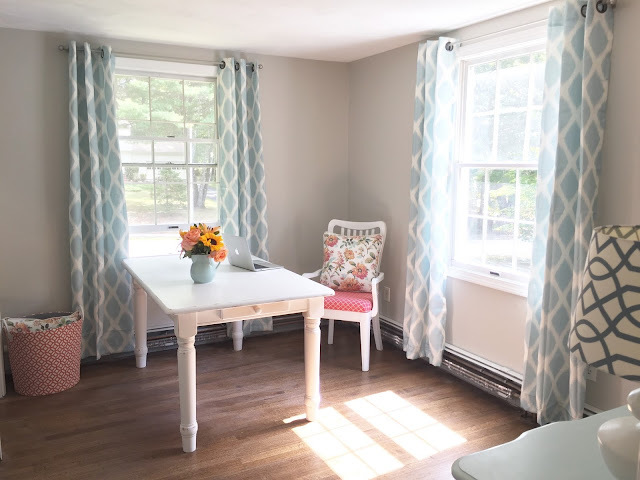 Although I plan to add a fun rug, install the radiator covers, and actually arrange the gallery wall (rather than just randomly throwing in some frames I already had), my craft room is coming along quite nicely! Both the table and dresser were thrifted finds that I repainted and I also painted and reupholstered the chair from a thrifted find! 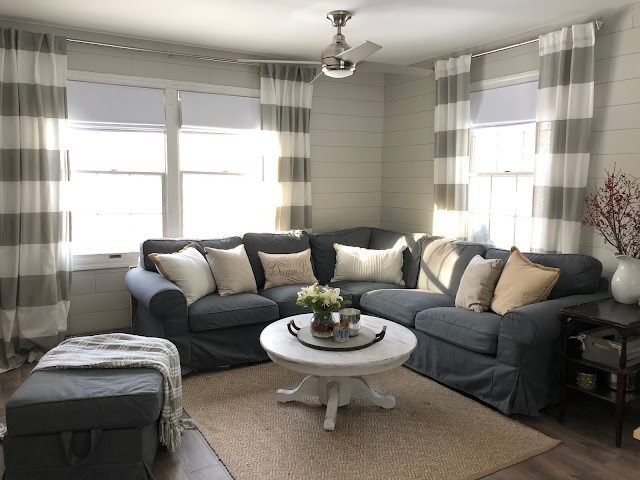 The wall color is Repose Gray by Sherwin Williams. The outside of the house was painted in Pussywillow by Sherwin Williams with a minty blue color for the doors called Palladian Blue by Benjamin Moore. While I really wanted to add a farmer's porch to the front, it just wasn't in the budget. I did have the front door replaced and added new moldings around the doors. The lighting on the exterior was also updated from brass to galvanized barn lights. 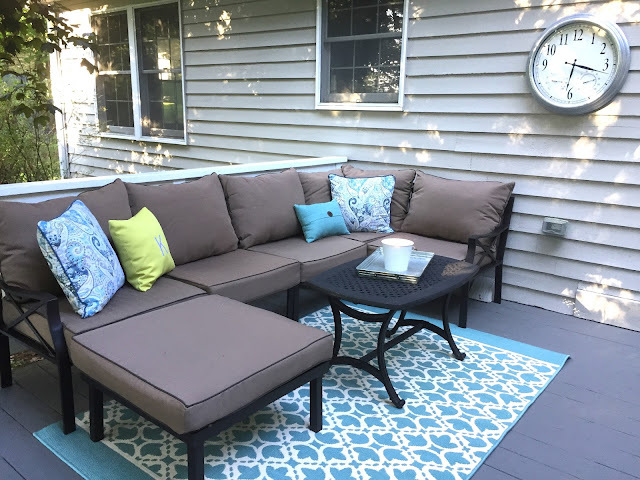 Those small changes were relatively inexpensive ways to improve the overall curb appeal. 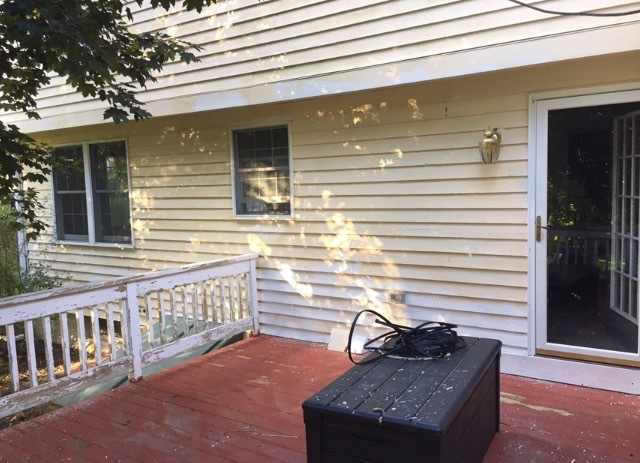 I have plans to paint the concrete front steps as well as the covered side entrance porch. But, those project will have to wait for warmer weather! 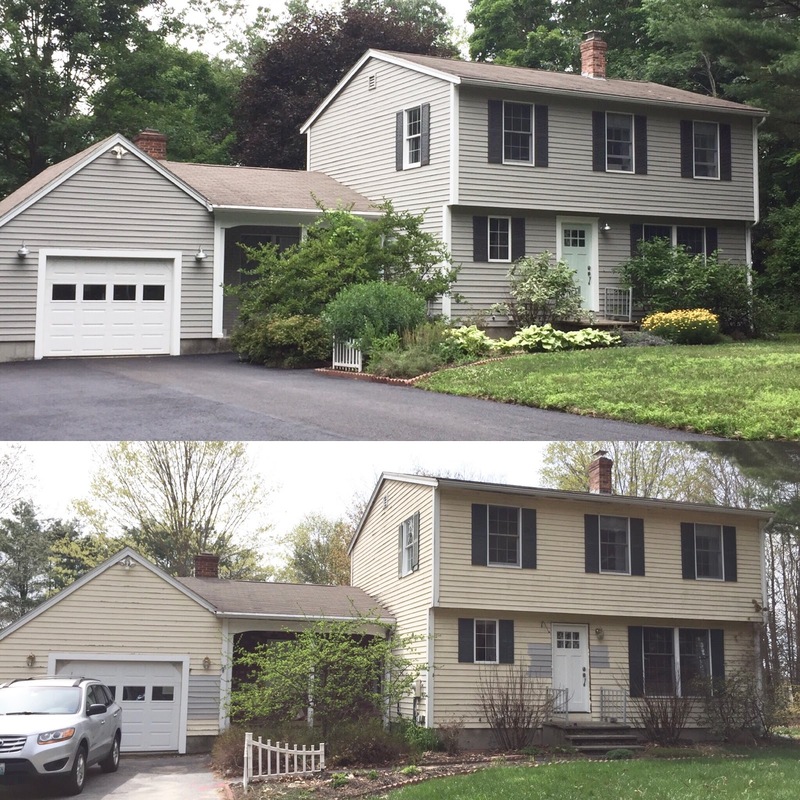 Looking back on all of these 'before' photos reminds me just how far we've come...and by 'we' I mean both the house and myself. 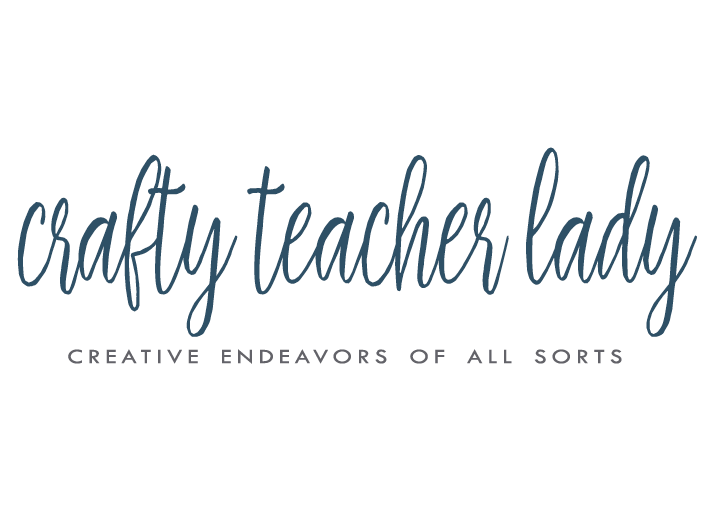 In this house I've tackled so many new projects that I had never done before including building custom pantry shelves, installing a plank wall, and attempting to refinish hardwood floors (it did not go well...but I'll save that for another post)! 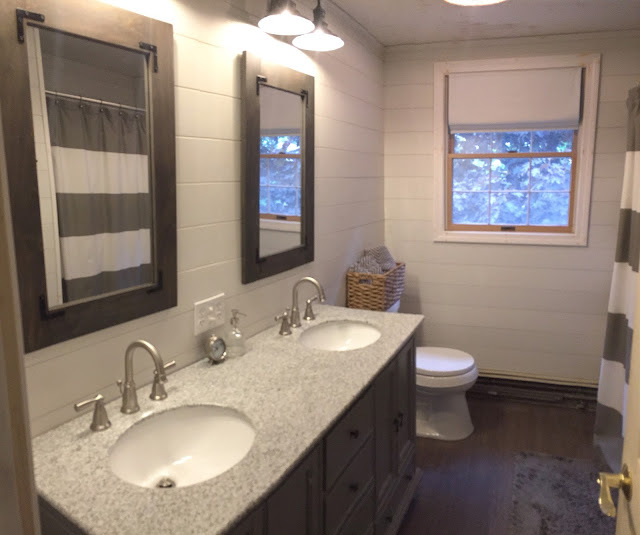 I feel a tremendous sense of accomplishment whenever I tackle something new, and I think that's why I enjoy renovating so much. I also really enjoy the creative process of seeing past the mess and envisioning how to turn a house into a home! I can't wait to see what this place looks like in another year! Catch me over on Instagram to see what project I'm currently tackling!